"Silk is so much different than paper. You cannot coat it with layers of paint. With minimum strokes you have to express your idea." It was the pursuit of silk that brought Marco Polo and the western world to India. 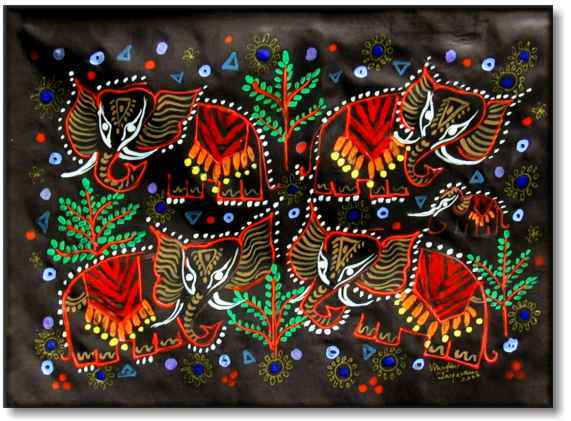 It was on silk scrolls and weavings that ancient Indian painters poured out their souls. And it was silk art that was patronized by royalty until the advent of paper. Perhaps it is this Indian obsession for silk that prompted Ms. Jayaraman to rise to this challenge. Ms. Jayaraman also enjoys painting on other media such as museum paper, wood and ceramics. These images tell the story of an immigrant who longs for the sights and sounds of India. Each painting reflects a story in her mind, and she has graciously provided each painting's accompanying text. Where befitting a story, we have added information to clarify the historical reference or customs. We invite you to look, linger and enjoy. Copyright © 2002 SilkEpics.com. All rights reserved. Legal Notice.